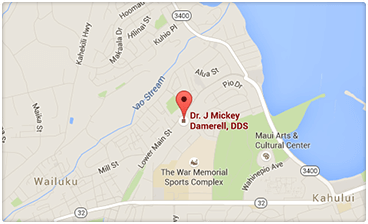 Upon your arrival at Maui Smile Works, please notify our receptionist. We can’t wait to welcome you to our office. Dr. Damerell will conduct a thorough clinical orthodontic examination and explain all aspects of treatment himself. When you are comfortable with the proposed treatment plan, then complete diagnostic records will be taken or scheduled. These typically include: digital study models of your teeth using a digital scanner instead of gooey impression material, digital photos of your face and teeth, and additional digital X-rays. If full payment is made at the onset of treatment, we will offer a 5% fee discount. To fit your individual needs, financial arrangements can be made to extend your payments over a period of months through in-house financing or Care Credit. For your convenience, we accept payment by VISA, MASTER CARD, AMERICAN EXPRESS, and automatic withdrawal. Orthodontic records, which consist of digital: x-rays, photos, study models and a personalized growth study workup to determine your treatment objectives. Active treatment fee for both early treatment options and complete comprehensive treatment with Invisalign or braces includes all appliances, office visits, and procedures performed in the office. Appliances are durable and should last through the entire treatment period if the patient follows instructions. If appliances require replacement due to loss, breakage, misuse or failure to eliminate foods that cause damage, we reserve the right to charge an additional replacement fee. The appointment when you get your appliances (braces, expanders, etc.) usually takes from one to two hours. You’ll then see us at regular intervals 4 to 8 weeks apart for an adjustment, which takes 20 to 40 minutes. Our regular office hours are Monday to Friday from 8:00 AM to 5:00 PM; one regular Saturday and one 11:00 AM to 8:00 PM weekday per month. Patients are seen by appointment only. We make every effort to be on time for our patients and ask that you extend the same courtesy to us. If you cannot keep an appointment, please notify us immediately. Cancel only if it is an emergency. It is difficult to reschedule you since most appointments are made 4 to 8 weeks in advance.